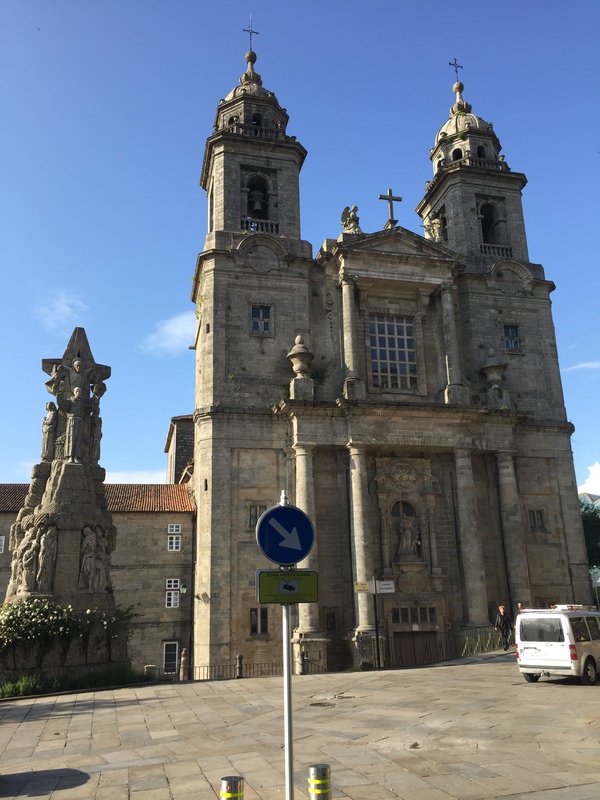 Continued from Walking Day 6: Padrón to Santiago. It was surreal to finally arrive! 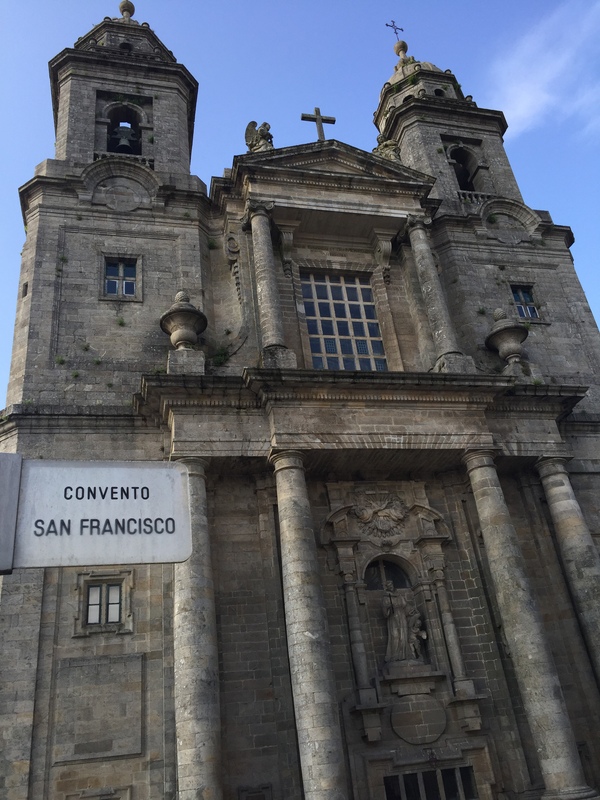 I kept a lookout for a “Camino de Santiago” sign to signify the achievement with a photo op, but the Portugués route does not have a landmark sign like the Camino Francés has. 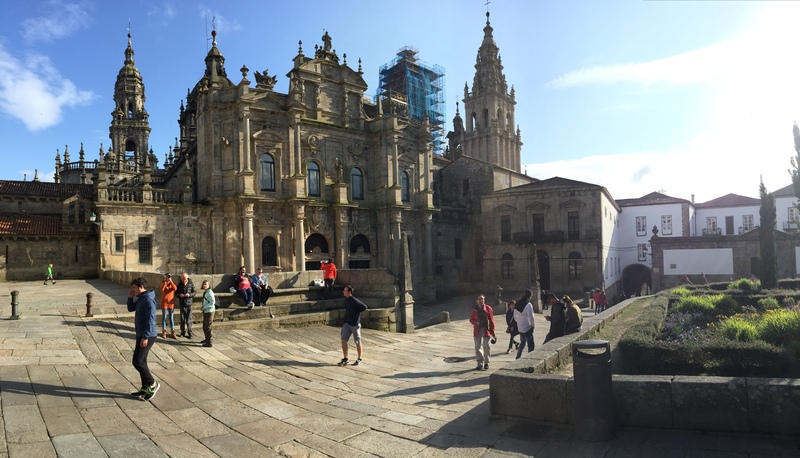 If I were not so exhausted, I would have stopped in Plaza del Obradoiro and taken a victory shot in front of the Cathedral, holding my backpack high. Alas, the skies were getting darker, and it was starting to rain. All I could think about was finding a bed for the night. I did not book an albergue in advance because I had no problems finding a bed over the past week (now I know better!). 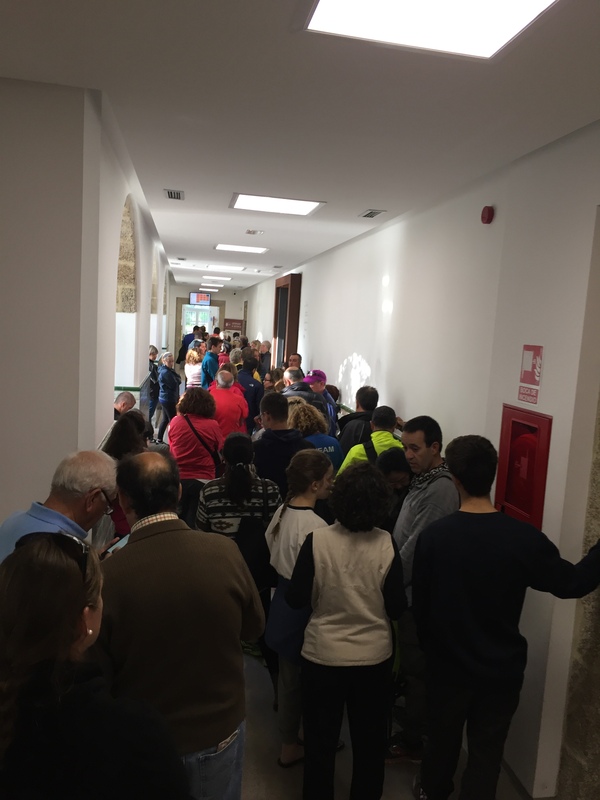 Yes, Santiago has many accommodations for pilgrims and tourists, but it was a Friday, and pilgrims were pouring into town to attend the Friday pilgrim mass at the Cathedral. I stopped in the tourist information center, which was buzzing with excitement. A friendly attendant said that almost every albergue was booked, but she checked and found that there were two private albergues with available beds. 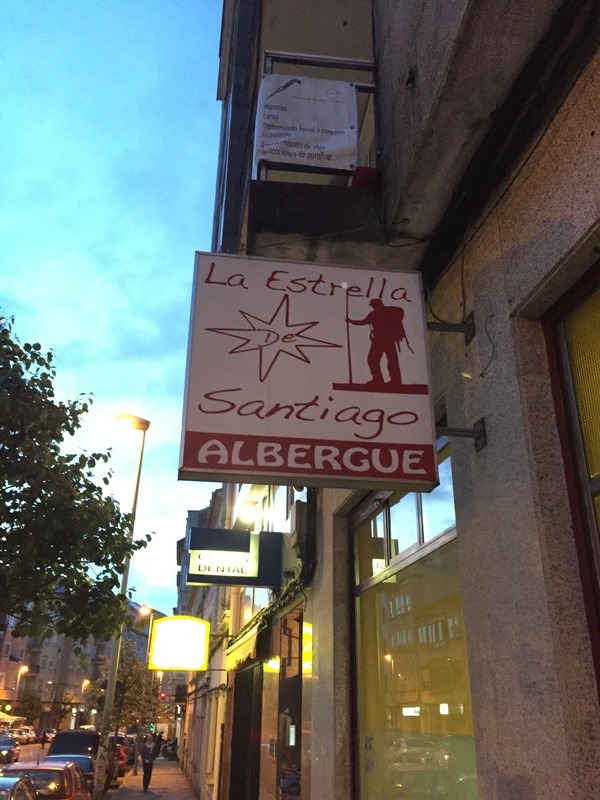 She called the closest one, they confirmed they still had one bed left, so she gave them my name and handed me a map to navigate to albergue La Estrella de Santiago. It was about a fifteen-minute walk from the center, north-east of the Parque Alameda. Looking at the bronze shell markers in the stone pavers, that was my victory moment. They read, “Europe was made on the pilgrim road to Compostela.” I have heard this saying before, but it was amazing to see this etched in different languages on my walk to the albergue. 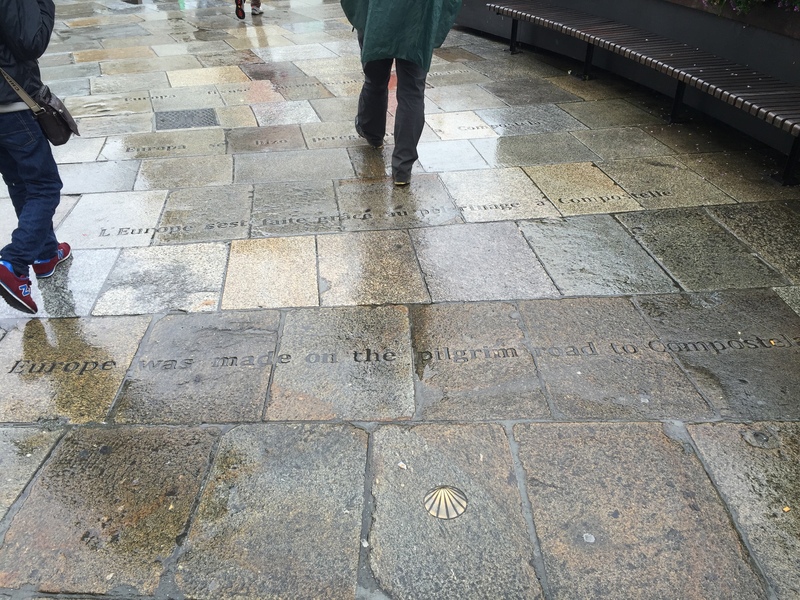 Europe was made on the pilgrim road to Compostela. This was my official “Welcome to Santiago” landmark. Finally, I arrived. And even though I was exhausted and wet, I was so grateful that I made my 100+ mile journey without injury or incident. 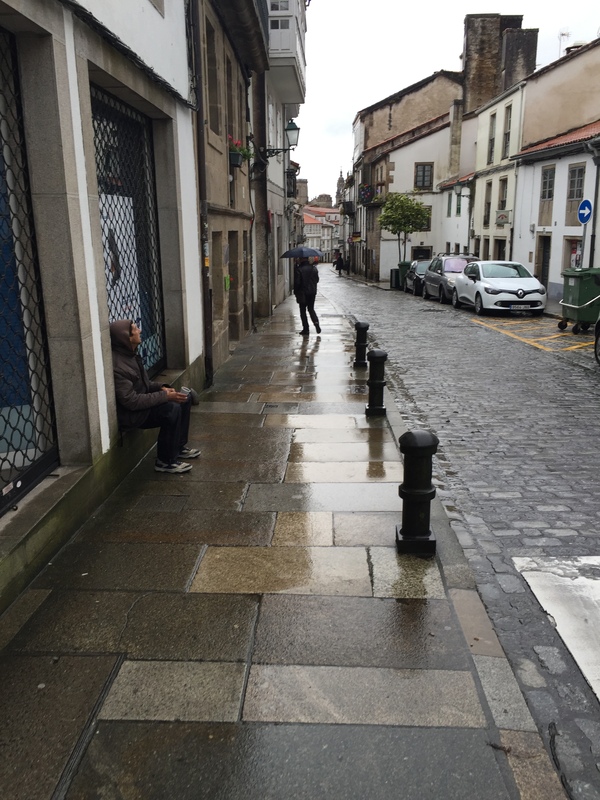 It had just started to rain when I walked to the albergue in Santiago. The private albergue I was lucky to get a bed at on the busy Friday night. Once in the albergue’s chaotic lobby, I realized how lucky I had been to get the last bed! There, a Korean man was trying to get a room, but the albergue owner kept telling him, “We’re completely full.” I felt sorry for him, he was in disbelief that they could not accommodate him. My legs were killing me after walking 27 km, so I did my ritual of putting my spa cream on my legs and doing the waterfall pose (legs up the wall) in a top bunk. I must have fallen asleep in that position because I woke up curled up in fetal position and do not recall making the shift. My siesta was only about one hour, just enough time to restore my energy. I went to the lobby, where a lot of people were taking shelter from the torrential rain. The vibe in this place was strange, and I did not feel like hanging out. I showered and put on my fancy pilgrim outfit—warm layers under my dress and my hiking boots—to head back to the heart of Santiago. But first, I went online to Booking.com to reserve a private room for the next day at Hospederia San Martin Pinario, located right next to the cathedral. By the time I was ready to head out, the sun was shining and the sidewalks were already dry! It was still chilly so I wore my down jacket, scarf, and hat. 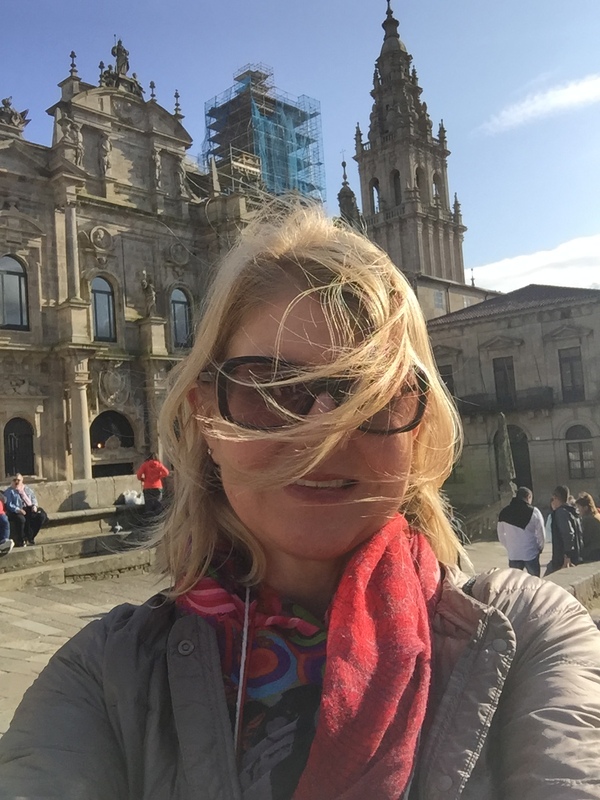 A selfie in front of the cathedral. A side entrance to the Cathedral. 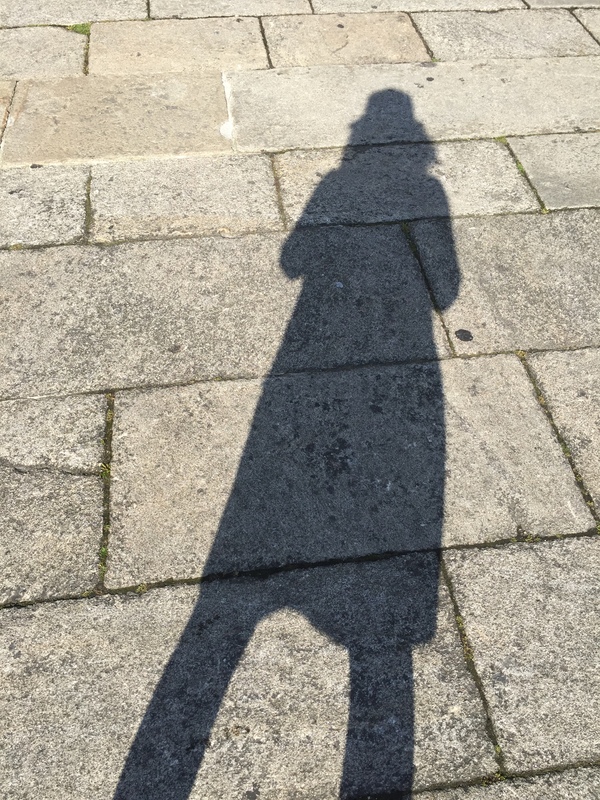 Long afternoon shadow in Santiago. Hooray for sunshine and fresh breeze! 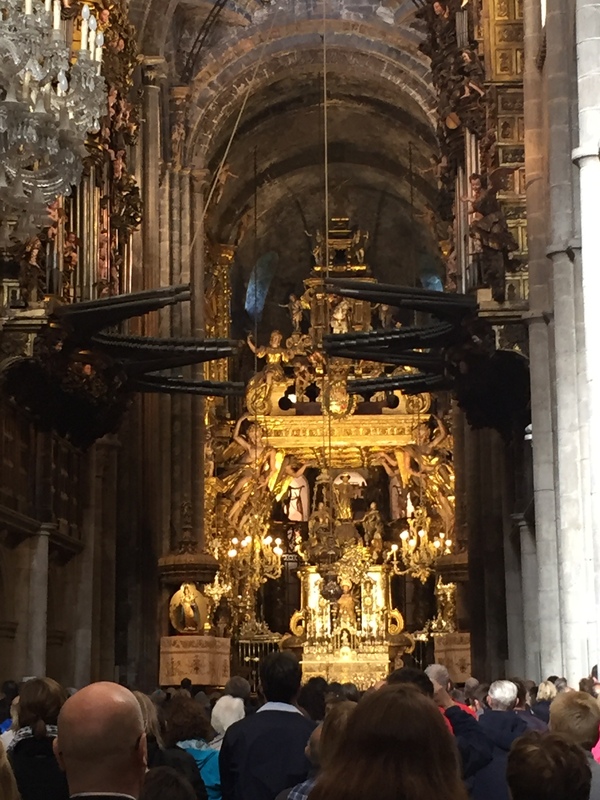 Pilgrim mass was crowded! Standing room only. After a beautiful service, I headed to the pilgrim office get my Compostela certificate of completion. On the way I saw the Convent of San Francisco. 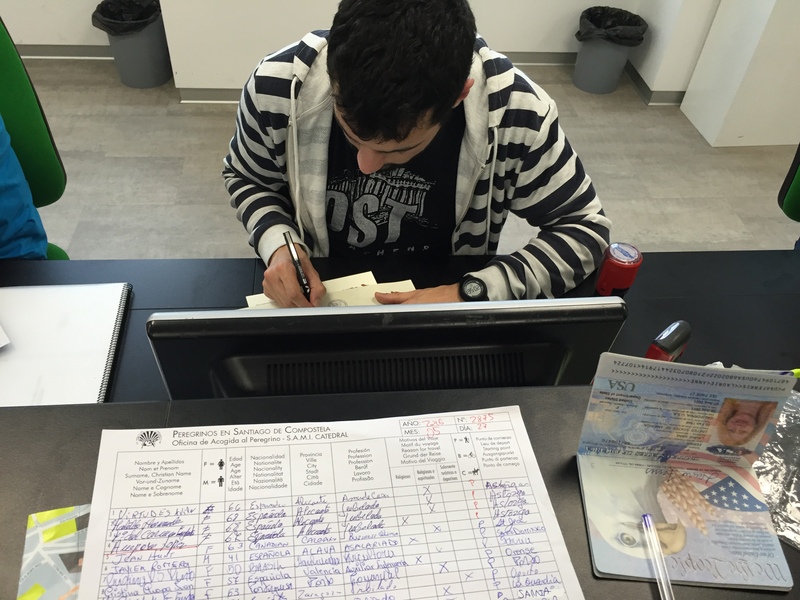 When I got to the pilgrim office, there was about a one-hour wait in line. 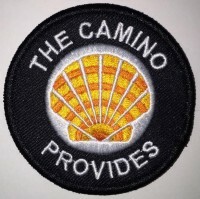 I chatted with some peregrinos around me and we shared Camino stories. Pilgrims from all over the world converge at the pilgrim office to commemorate their Camino. 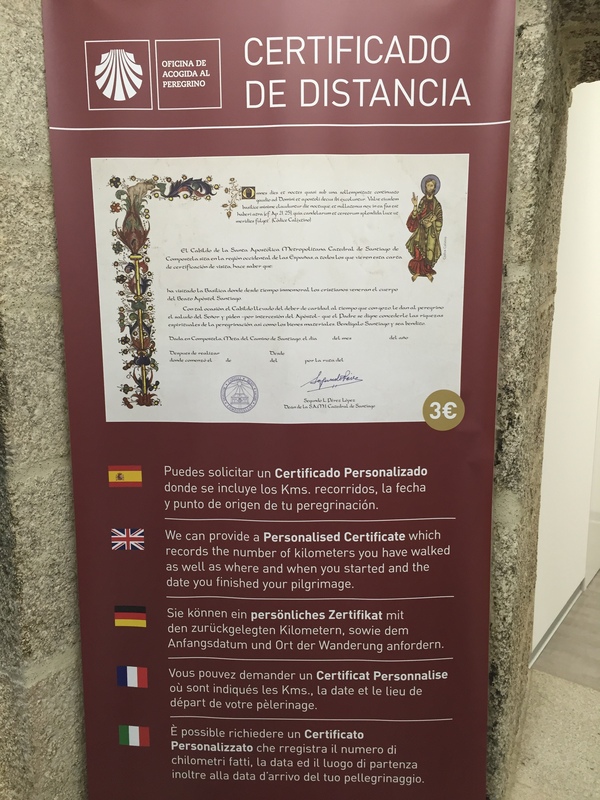 The regular Compostela certificates are free, but you can get an additional certificate showing your starting point and total distance for 3 euros. I decided to get one! An hour or so later, I finally was next in line to get my certificate. 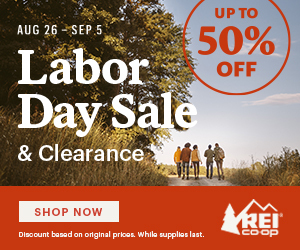 I showed my passport, credential full of stamps and signed my name in the pilgrims log. 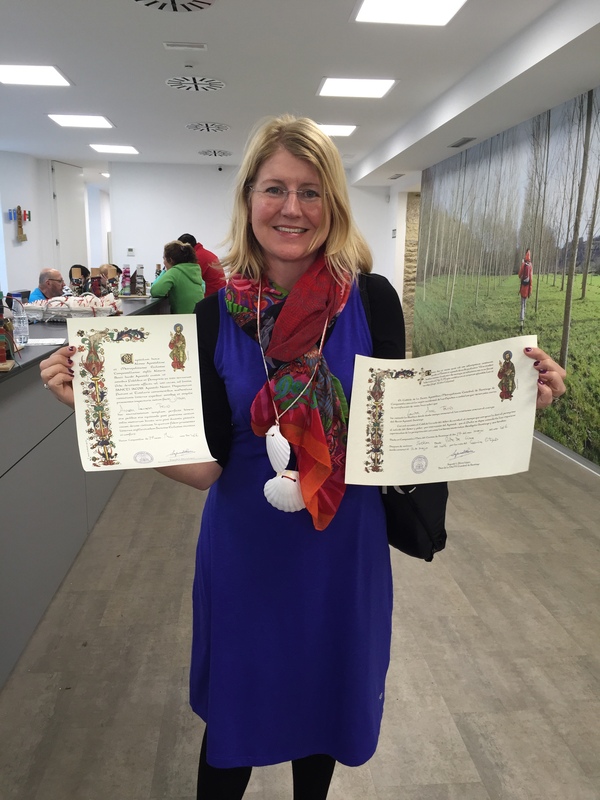 Proudly holding Compostela certificate on the left and distance certificate on the right. 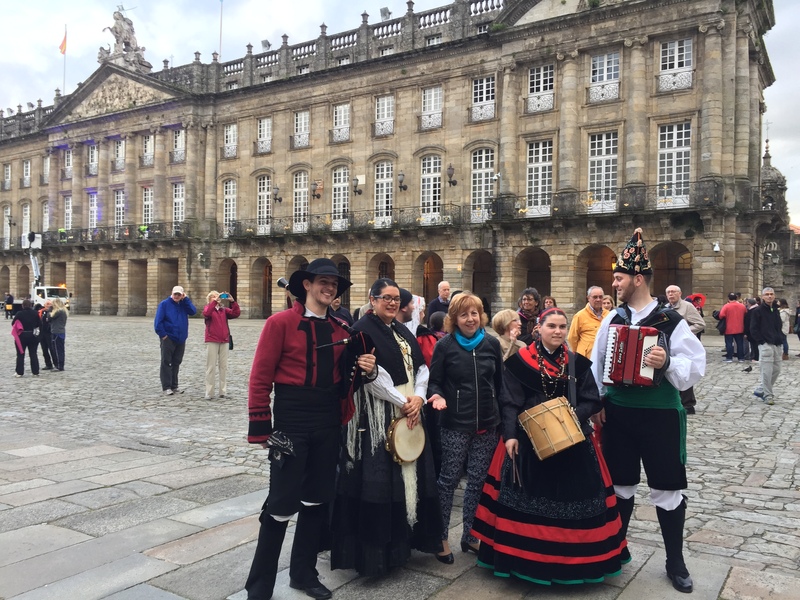 Later in Plaza del Obradoiro, a group of musicians entertained the crowds. 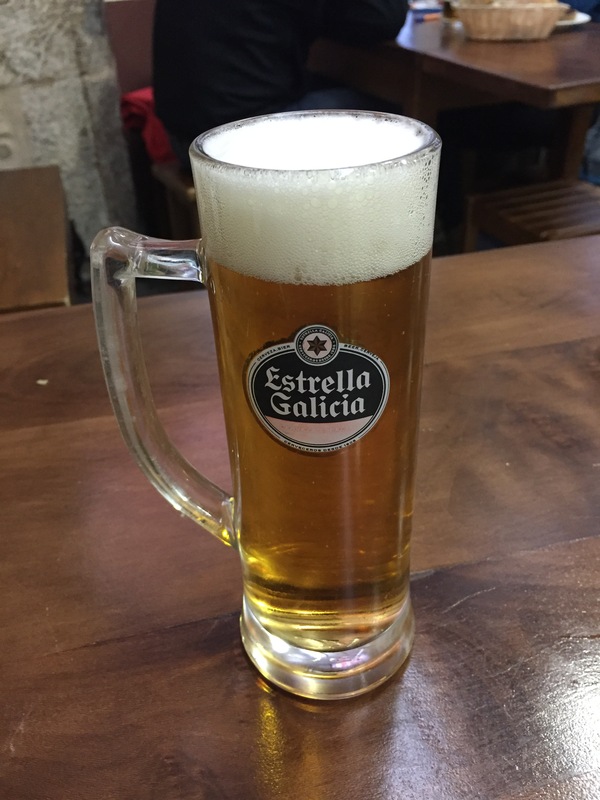 Galicia’s finest beer, Estrella! A refreshing, well-deserved drink. After a nice meal and beer, I roamed around a bit, then went back to the albergue for my last night in a bunk bed. Up next, Santiago Highlights: Hospedería San Martín Pinario, a Pilgrim’s Paradise. 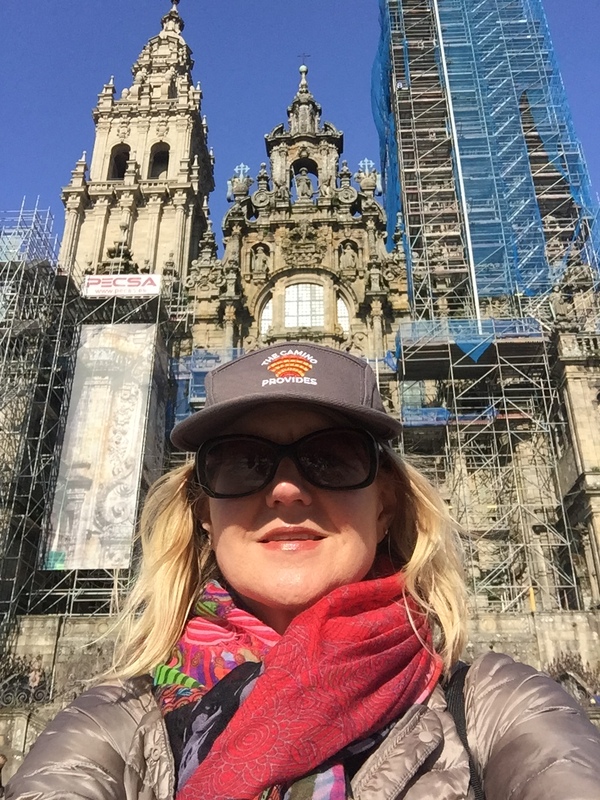 Back in Porto, just finishd my camino in Santiago, then Muxia and Finisterre. My blog is in Dutch but photos speak their international language. Hans, congratulations! I saw your blog and wish I could understand Dutch. I would love to hear about your Camino. Did it provide? 😊 Would you like to write a guest post? Yes! 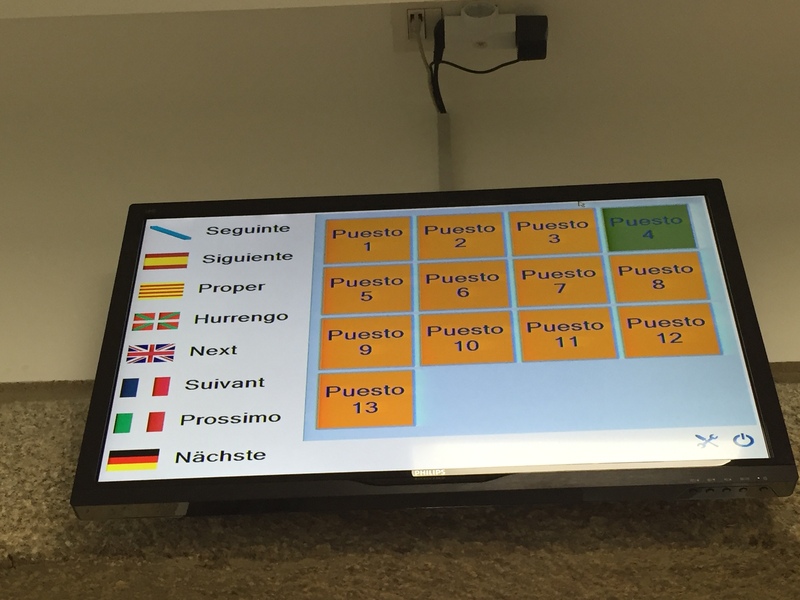 So Basque trumps Portuguese. Hurrengo sounds like “hurry and go.”Ha! Now we know the origin! u-RRRRRRRRREEEEEN-go. Probably hurry and go, it’s going to rain again. Thanks Jacqui! That’s the beautiful thing about the Camino, everyone has a unique experience, even though we walked in the same paths. When did you go?